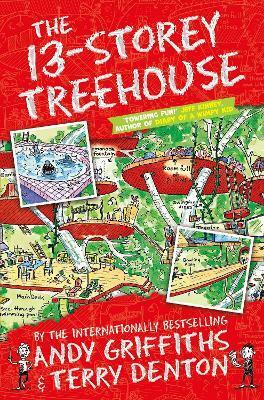 The 13-Storey Treehouse is the first book in Andy Griffiths and Terry Denton's wacky treehouse adventures, where the laugh-out-loud story is told through a combination of text and fantastic cartoon-style illustrations. Disclaimer: We won the first four books in the series in a giveaway by Lovereading4kids and Macmillan Kids. This in now way affects the tough judgement that all thirty children have passed on this book. * Toppsta Reviewer * This is silly and fun and a great book to encourage of love of reading in young children. I read this to my 5 year old daughter and months later she still makes reference to a scene in the book. She is a strong reader for her age and wanted to get the other books in the series. She started reading more bits of them herself before devouring the 65 and 78-storey treehouse books entirely by herself. The 78-Storey Treehouse she read in one sitting. She can't wait for the 91-Storey Treehouse to come out later this year. * Toppsta Reviewer * I bought the set of these after reading the other Toppsta reviews. My son read this book solidly in one day. He has LOVED it, the mix of text and illustrations is ideal for this age range, I could hear him laughing away to himself whilst he was reading it, although I'm not convinced he followed the whole story, he has since read most of it again (as we were out and the next one was at home) A fabulous buy that will be read time and time again. * Toppsta Reviewer * Brilliant series and if you haven't read them yet why not? Start at the beginning and work through them all. Laugh out loud funny and I love reading about all the things they have in their treehouse. * Toppsta Reviewer * I liked this book as it was funny, adventures and most importantly troublesome.Andy and Terry were hilariously brilliant. * Toppsta Reviewer * I bought this book (the first in a series) on the basis of many positive reviews. Having now read it, I know my decision is vindicated. It's funny, hugely imaginative and has LOTS of pictures. What child would not want a treehouse with see-through swimming pool, lemonade fountain, games room, bowling alley and marshmallow machine? Besides, this one is also home to book-making duo Andy, the writer, and Terry, the illustrator. But story-making isn't always straightforward, especially when there are gorillas to contend with. No matter, flying cats to the rescue! And when the story is over, there are still jokes, a spot-the-difference, a maze, wordsearch and treehouse triva to enjoy. Children with the latest brain-to-brain-information technology will be able to read it; others will have to ask for it at the library or a bookshop. They will also want to visit http://www.andygriffiths.com.au/ for loads more fun and the latest from author Andy Griffiths. * Toppsta Reviewer * My son: I like this book because of the funny pictures. One of my favourite ones was of a man on the toilet flying using balloons. It is funny how Terry will do anything not to write their book. I think it is a great book. Mum: My son has been reading this aloud to me. Whilst there are over two hundred pages to this book, a lot of it is taken up with humorous black and white illustrations. It is quite a wacky sort of book, with an off beat sense of humour (sea monsters disguised as mermaids, catnaries (cross between a cat and a canary), self portrait of finger labelled with moose, finger prince, singing flea.... etc.) which definitely appeals to my seven year old. We bought this as part of a set from Book People. So thankfully it has been a hit so far. * Toppsta Reviewer * Having read The 78-Storey Treehouse and lived it we requested this from the library. My son loves these books and studies the illustrations which adorn every page. The 13-Storey Treehouse won the Sainsburys Children's Book Award in 2015, the Lancashire Fantastic Book Award in 2016, as well as the 2016 Coventry Inspiration Award.